Struck9 is a Colombian EBM project set up in 2008. After a debut album (cf. “Democracy”) released in their homeland on Black Leather Records (2010) the band is now back on track with a new opus. They joined hands with EK Product to unleash their “Ritual Body Music”. Struck9 stands for pure old-school EBM with a raw and somewhat unpolished production. The sound might remind you of great names such as DAF, Armageddon Dildos and co, but I also have to say this band has a very own approach. The songs are well-crafted and not just an easy and cheap EBM cliché. Both last songs are remixes by Autodafeh and Atropine. This is retro-EBM, but with a personal style and attitude. The songs might appear ‘classical’, but they’re well-crafted and accomplished with little details like cool bleeps, metal percussion sounds at the right place and simple, but efficient tunes. The album features a succession of great songs and honestly there’s no song to throw away. Struck9 doesn’t reinvent EBM, but will please all lovers of the genre by this outstanding work. The unpolished sound production is pretty vintage-like, but it took me a few minutes to get used to it. I think a more contemporary (and professional) production would give an extra to the album although the spirit would maybe be different. It’s a bit the same for the production of the vocals. So in the end it’s pure old-styled EBM in influences and production. The remixes of Autodafeh and Atropine are cool, but I personally prefer the original versions. Struck9 doesn’t innovate, but this album is absolutely phenomenal. I even dare to say one of the best EBM releases I’ve heard in months! 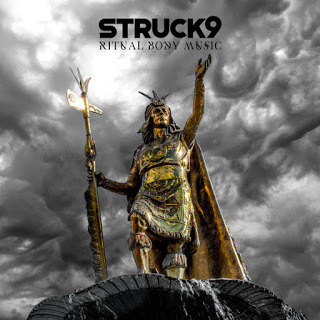 Share the post "Struck 9 – Ritual Body Music | Review by Side-Line magazine"